We are on our last day in Jaffna, the absolute top of the Island of Sri Lanka. Once the second biggest city in Sri Lanka, following the civil war, it is now the twelfth largest. We had a great ninety minute flight from Colombo to get here – a vast improvement on the alternative of a 14-hour bus trip, bumping along very pot-holed roads through some of the country’s last military check points. 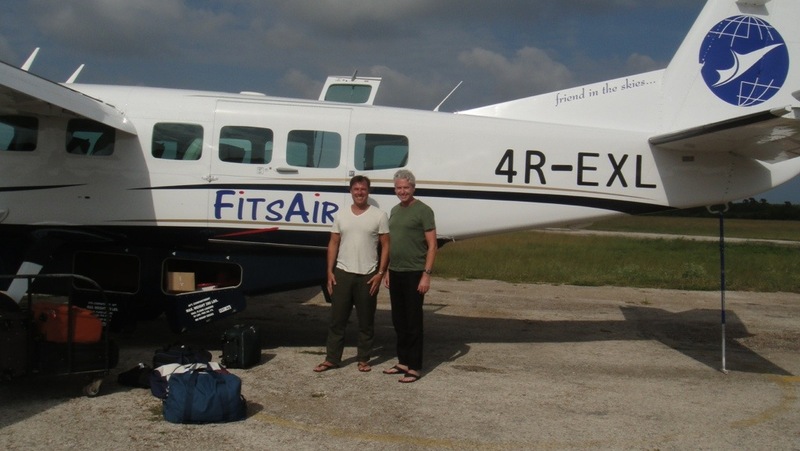 Flying 400km up the palm-fringed coastline in a twelve-seater Cessna Grand Caravan, I really felt like I was following the West Australian coast. The terrain changed from lush jungle to an ochre-coloured, scrubby land. Remnants of the civil war that ended four years ago are ever-present. The smiles and ‘hellos’ that greeted us everywhere we wandered in the south have been replaced by wary and uncertain faces. The children are the ones who return our smiles, less affected by their country’s tragic past. The city and surrounding towns display stark reminders of the bloody battles that raged for 26 years: burnt out houses, bombed landscape and areas still off limits due to unexploded land mines. Even in the city of Jaffna, houses are pot-marked by bullets, with some bullet shells still embedded in the masonry walls. Our hotel is in what we presume was one of the safest neighbourhoods; the Jaffna King’s city palace (or at least its remains) is not far away, and the UNHCR headquarters is just two doors down from our hotel. 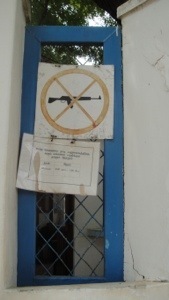 The iconic bright blue and white perimeter wall of the UN has a “Guns Prohibited” warning sign on the entrance gate – a telling replacement for “Beware of Dog”. 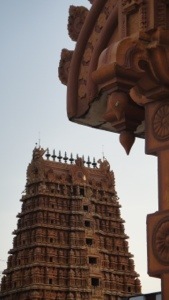 This ancient neighbourhood is also home to the most sacred of Hindu temples, Nallur Kandaswamy Kovil. We attended the evening service in this massive sprawling religious complex, home to a colourful array of deities. In total awe and bewilderment, we were included in a procession of incense, bell ringing and coconut smashing. With bare chest (gut sucked in) and bare feet, we followed the holy man as his acolytes wheeled a peacock-shaped god in a wooden chariot – complete with fairy lights – visiting various other god’s alcoves in the pillared cloister. The service finished with the priest offering coconut milk and a sweet coconut mixture by hand to the congregation. I warily accepted; since it was “holy”, there was no way I was going to get sick! Sounds strange. It was, but the ‘service’ was welcoming, mystical and beautiful. Yep getting all hippy on you. It was, in a way, like a Catholic Mass. I know: strike me down with lightning all you papalists. We visited the famous Dutch fort in the city centre, built in 1680. Over the course of the war, the military and the LTTE (Tamil Tigers) repeatedly fought over this ~fifty acre stone bastion, in a series of sieges and attacks. 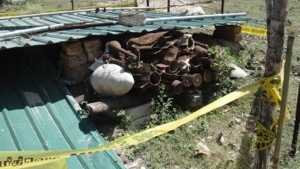 The Sri Lankan Army vacated the fort just the week prior to our visit, leaving a fenced-off ordnance dump filled with rusted rockets and mines, still unexploded. Eerily, in the fort’s centre are the remains of a destroyed Dutch church. Strangely, one internal wall is covered in bullet holes; no other wall is scarred by this telling vestige of the ruthless struggle by the ethnic Tamils for an independent homeland. The fort is already being repaired and will be a the best and biggest in a series of historic Dutch forts that inhabit strategic locations around the island. It hasn’t all been flack jackets and combat boots; in fact, our pret-a-porter has been t-shirt and thongs. We’ve toured this Hindu city with its amazingly brightly-painted temples dedicated to monkey gods, sacred cows and the multi-armed Shiva who takes the ability to multi-task to a new level. Yesterday we bathed in Jaffna’s version of Bondi’s Icebergs (Canadians insert Kits Pool). This country has quite a few sacred pools. Here the devoted immerse themselves in what is usually a mosquito-infested pond of green water, littered in plastic bottles and in unidentifiable floating objects. Needless to say, this Australian son who is spoilt with clean beaches and pools, always declines to wash his many sins away. This pool, however, although light green and slightly slimy, was filled with ocean water. So I jumped in and was invited by the younger devotees to partake in a Sri Lanka vs Australia swimming contest. Viva Australia! Thanks for all those years of swimming coaches, Mum and Dad. I did the Green and Gold proud … or maybe the teenage competition was being kind. We managed to visit the Jaffna Library (shhh) that kicked off the whole civil war. In 1981, a Sinhalese mob (from the country’s ethnic majority) burnt down the oldest and largest library in South Asia, containing a priceless repository of ancient books written on palm leaves and first editions from around the world. 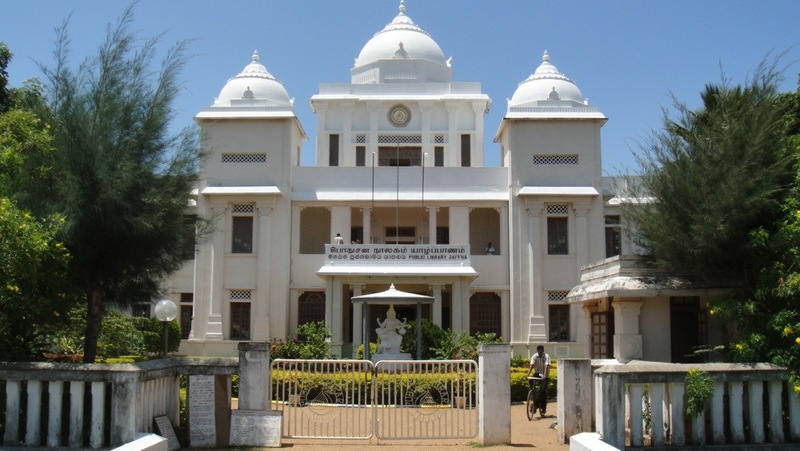 The Jaffna Library has since been authentically reconstructed, and thanks to donors from around the world, has a larger selection of reading material than before, everything from Alistair McLean to How to Care for a Koala. Oh – did I mention that this city is mostly vegetarian, and an alcoholic desert? 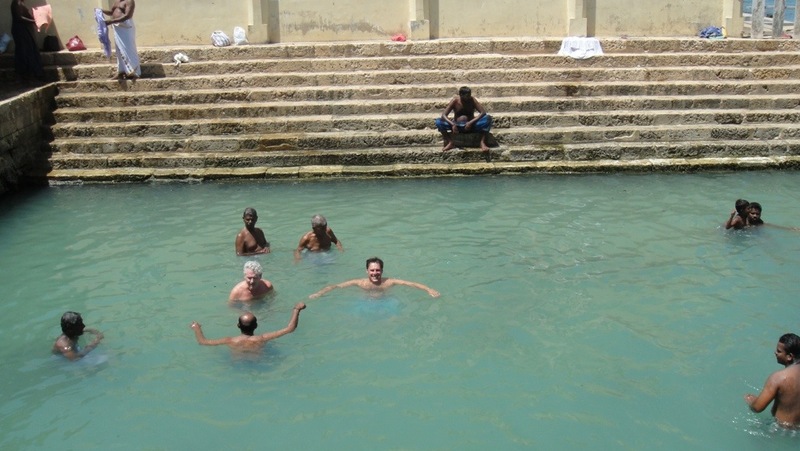 Did it to you again, Mikey – remember our “Religious Detox” in Pushkar? At least this is only a three day purgatory. So today we are visiting the markets, where the speciality is palmyrah palm woven products; should keep Australian customs and quarantine busy on my return. Then tomorrow a seven hour van ride to the beaches on the east coast. Trincomalee: less evidence of the civil war, less religion, less vegetarian menus, and back to beers on the beach. 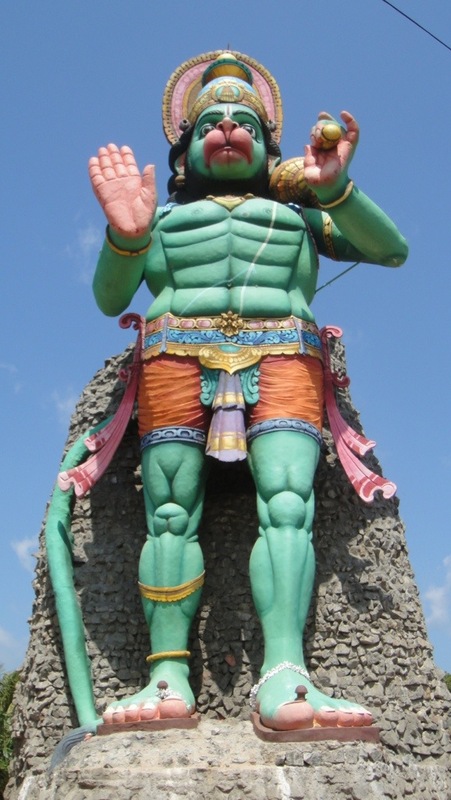 This entry was posted in Sri Lanka and tagged Jaffna, Nallur Kovil, Sri Lanka. Bookmark the permalink.